Happy Feet Dance School - Cece Bechelli - Director and Caitlin Bechelli McSunas explains to Marin Magazine their business philosophy, competitive edge and other information that makes their work worthwhile. 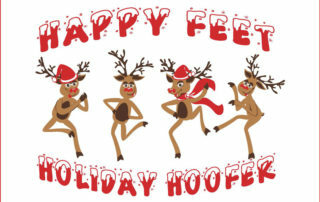 Mill Valley Winterfest - Featuring Happy Feet Dance School - Holiday Hoofers! Celebrate Mill Valley's annual holiday celebration - Mill Valley Winterfest Sunday, December 4, 2016. Party in the USA! Teen Tappers ready to hit the Shim Sham! Shim Sham in the Street! May 2015 - Cece Bechelli and Caitlin Bechelli perform original choreography as a tribute to Duke Ellington and the Whitman Sisters.